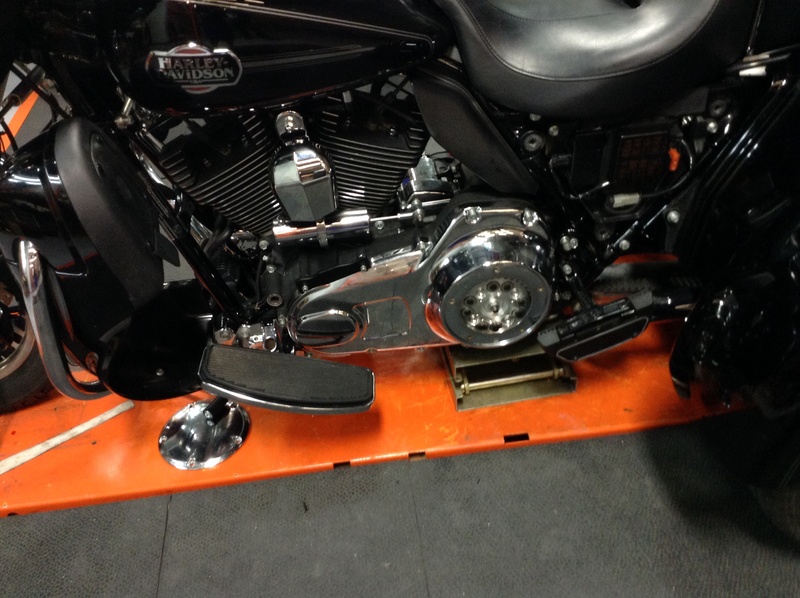 I took a trip to Visions Harley Davidson in Repentigny and discovered work being done on my trike. Modifications are described below. 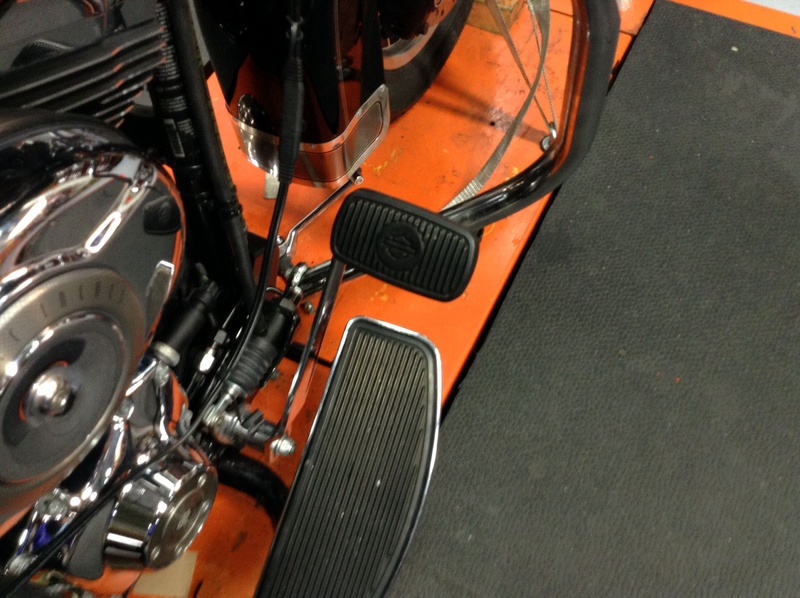 Notice the lever which operates the front brake (the key ring is attached to the lever being discussed) – since someone with messed up hands cannot very well – if at all – operate that lever, it’s operation has been converted to the foot pedal in the following photo. [Photo #2]. That break pedal operates both brakes – front and back. The brake lever has been left on as shown here so that when and if bike is sold, it will be there for the trike’s next owner who will be more comfortable using that lever if he has ridden before. Otherwise, it doesn’t matter unless the owner of the modified trike wants to lend the bike to a friend which I really doubt. If that was my trike, not even Gaston mon vrai et plus grand ami, would ride it under normal circumstances. I don’t think so anyway. Note also the little pad at the end of the accelerator in the middle-right section of the photo. 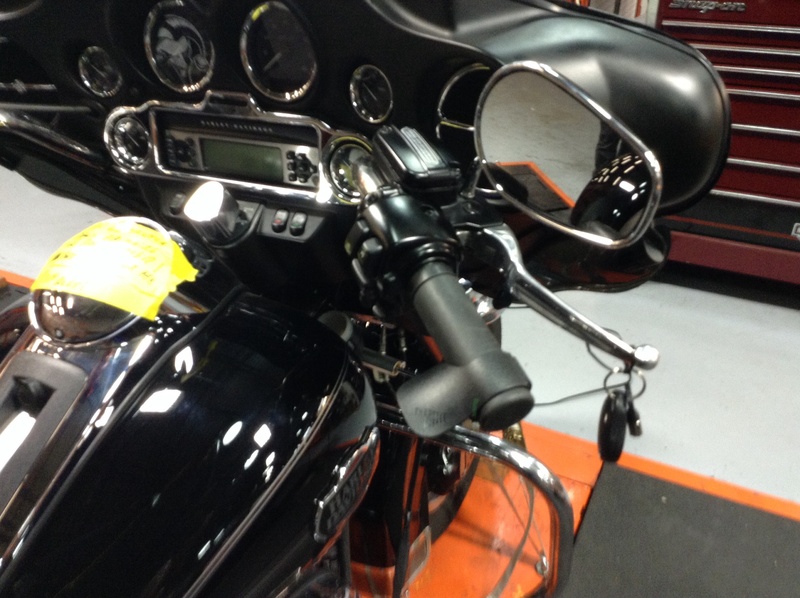 This is to assist the rider who does not have normal use of his hands in holding the accelerator open. 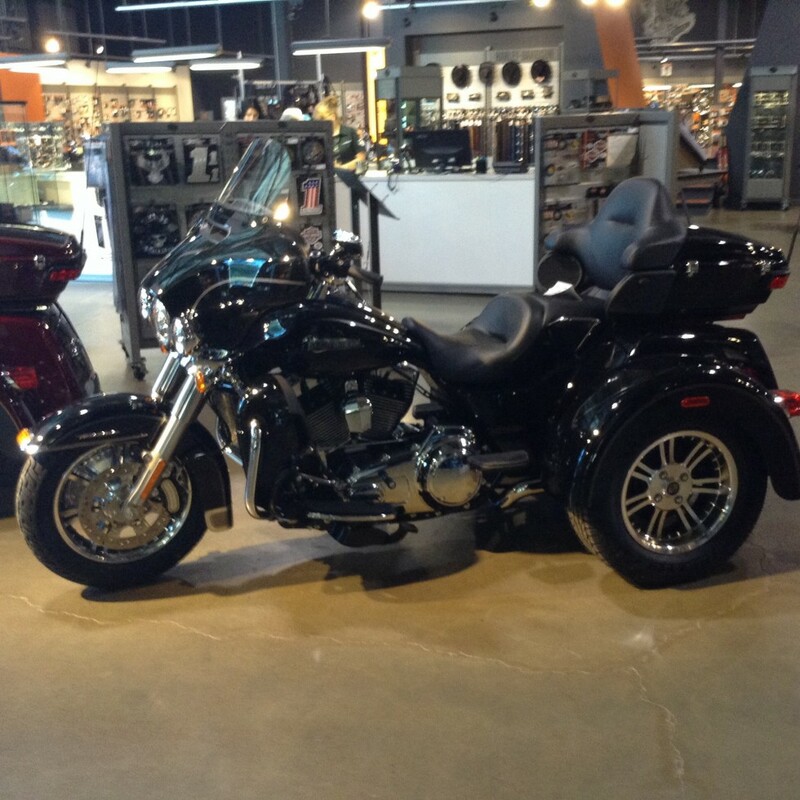 Cruise control, another feature of this trike, will assist on highways. Brake pedal (right side). See above. This pedal also exists on non-modified 2011’s, but in that case, the pedal is for the back brake only while the above-mentioned lever operates the brake in front. The pedal in this photo operates both breaks. 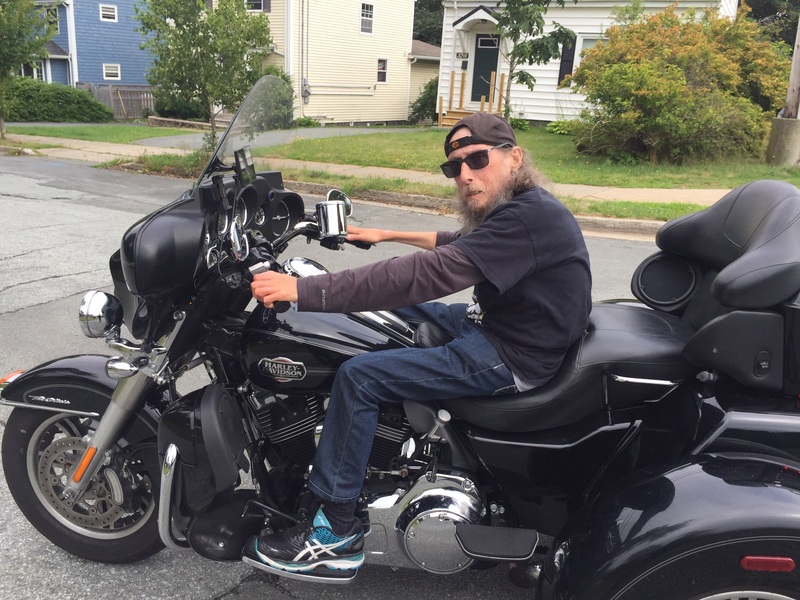 This feature enables the physically challenged biker to use his right foot rather than his disabled hand to operate both brakes, front and back, simultaneously. Nice feature. The front brake lever still works and can be used in tandem with the brake pedal. This photo shows the lower left side of the bike. 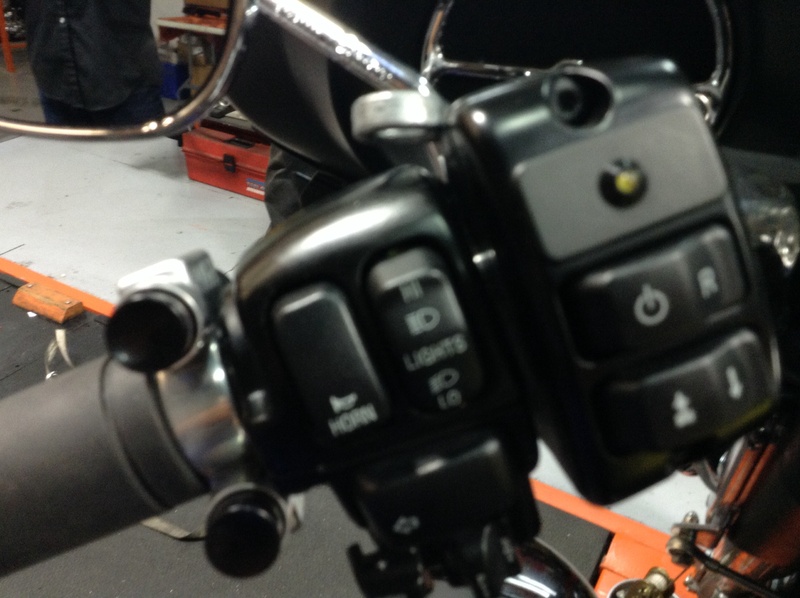 The shifter foot peg has obviously been removed to make room for the foot clutch. Shifting is now done with the two buttons described above. The foot clutch has not yet been installed, but when it is, it will be positioned right here. This foot clutch will be placed where the shifter peg used to be and is used longer stops to release pressure on clutch plates. I use a suicide shifter (shown below) rarely deploying the buttons. More photos to come : shifter suicide style, foot clutch. Above we can see both the shifter, located just to the right of my left leg, and the black foot clutch, located just above my foot, L-shaped piece of metal. In the final analysis, the foot clutch is not necessary and I haven’t used it since my clutch was replaced in Tampa, FL. last February.